The Organ is a quarterly magazine including articles on new and historic instruments worldwide, organists, composers, festivals and competitions, along with reviews of concerts, recordings, books and new music, all in full colour. 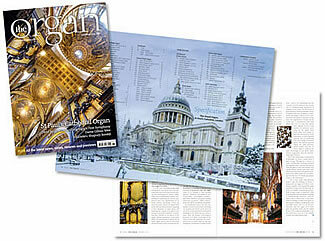 If you haven't seen a copy of The Organ recently, contact us for a copy with our compliments (UK offer only). Each full colour edition of The Organ includes many well-illustrated articles on the instruments, festivals, personalities and hot topics of the organ world. Also exclusive to the magazine are reviews of organ music, letters, choir and organ CD reviews, and details of newly installed pipe organs. To receive a sample copy without obligation to subscribe, simply send us your name and address (UK only). 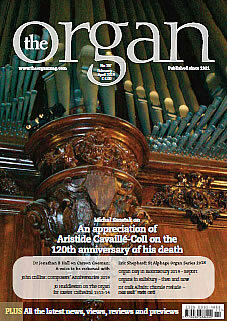 With an increasing circulation, the Organ Magazine is the leading quarterly magazine devoted to the organ world. Advertising in The Organ can help you reach a highly relevant audience of composers, organists, venues and fans all over the world. We can offer print and online advertising options. Please see details of our print advert specifications (pdf format) and contact advertising@musicalopinion.com for online advertising options or to place your advert today.